The Pulsar Watch Company offers a wide variety of watches for men and women in both dress and sports styles, including the company’s “Tech Gear,” “Crystal Collection” and “Double Time” watch collections. Pulsar chronograph watches feature analog movement and are available at many department stores and authorized Pulsar watch retailers. Setting a Pulsar chronograph watch only takes a few minutes and is relatively simple to do. Turn the small knob in the middle of the right-hand side of the watch, called the crown, in a counterclockwise motion until you no longer feel resistance. Pull the crown out. Pull the crown out until two clicks are audible when the second hand reaches 12:00. Turn the crown until the desired hour and minute time are set on the watch face. Push the crown in one click and turn clockwise until the correct date shows on the watch face. Push the crown back into the side of the watch and turn until you feel resistance. Press the button on the top right-hand side of the watch for two seconds. This will activate the stopwatch. Press the button on the bottom right-hand side of the watch until the stopwatch is at the “0” position. 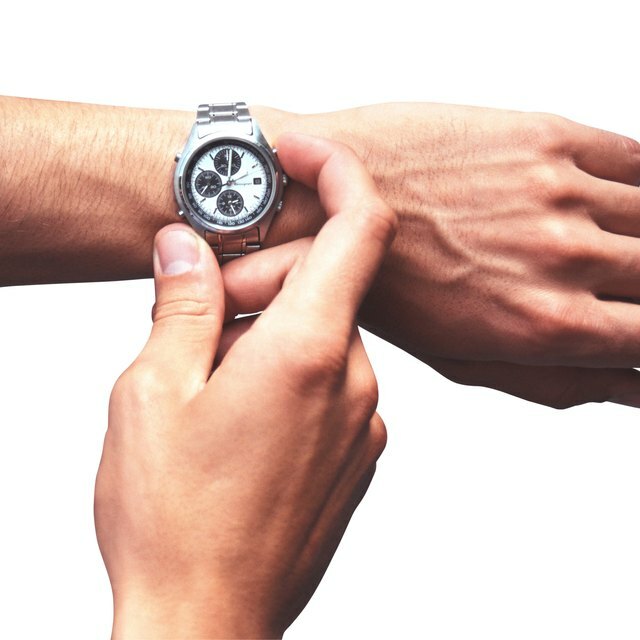 Press the button on the top right-hand side of the watch to start, stop and restart the stopwatch. How Do I Set a Casio Module 4756 Watch?